Я ученый в области естествознание. Литературой интересуюсь с молодых лет. С 1994 года, когда стал моя стихотворение “Что делел бы мир без Хорезма? !” песни-бецеллера я начал вплотную заниматься литературой. Я получил признание как писателя в 1999 году, после издане моей книга “Вакил” (Уполномоченный), который стал бестцеллером. I am a scientist in the field of natural science. I have been interested in literature since my youth. 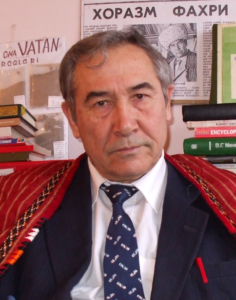 Since 1994, when my poem “What would the world do without Khorezm ? !” became the best-selling song, I began to engage in literature. I received recognition as a writer in 1999, after the publication of my book “Vakil” (Authorised), which became a best-seller. In the spring of 1948, the family of Khasanmirot and Tazagul, who was the enemy of the Bolsheviks, was replenished, a son was born, and with good intentions he wanted to give the name of great grandfather on the maternal line,the great encyclopaedic scholar- Muhammad al-Khorazmiy. – “Muhammad” as a religious name (from the Prophet Muhammad SAW), can bring trouble first and foremost to you and himself. It is better to give him, for example, the name of Marx, Vilen (Vladimir Ilyich Lenin), October, Mels (Marx, Engels, Lenin, Stalin), Mir (Peace) and the like. For safety reasons and on the recommendation of Makhsim bobo, (as Prophet SAW kalledAkhmad as well) he was called “Akhmad” and later in all documents it was written. Thus, from the age of three Akhmad was with Abdullah kari, whose eyes were almost never seen, and Akhmad memorized the verses from the Qur’an, which Abdullah kari constantly repeated. By the year 1950, the persecution of Islam has somewhat softened. However, due to the Stalinist repression, almost no literate people remained in Islam. For the above reason, and because Akhmad was very small (4 years) and by law the Communists could not bring him to justice, to meet the needs of the population of thevillage in knowledge of Islam and prayers, Abdullah kari called his disciple – Akhmad to be a teacher in Islam and prayers. Thus, four-year-old Akhmad conducted lessons of teaching Islam, prayer rules, chapters and verses of the Holy Quran to 10-15 women of the Turkmanlikvillage 3-4 times a week. These 40-50 year old students, despite the fact that no one asked for them, did not come to each lesson empty-handed. Someone brought one or two eggs, one or two zogoras, some a handful of lentils or rice. Thus, all 3 family members earned – contributed to the family budget: the father – on the collective farm, the mother – in the mill, the 4-year-old Akhmad – as a teacher. But Ahmad’s earning was much more than the earnings of the father and mother of both taken together. Therefore, his father often said: “My son, first of all with the help of God, and also thanks to Makhsim bobo, began to feed the family from 3-4 years. We really hope for Akhmad”. -My son, I turned 70 this month. All collective farmers are retiring at 60 years of age. Although I am very old, I continue to work, because you are still young. In our family, the elder is you, you are now 13 years old, that is, you are no longer a child. As the proverb says – “the horse’s place takes a foal”, that is, it’s time to replace me. And thus thirteen-year-old AkhmadKhorazmiy became labourer. In the mornings he in a hurry, ate a little patrak, zogora with tea and went to the school “Yangi kadam” in 7-8 km. After dinner came tired and quickly ate the remains of his patron, took a shovel or a ketmen and fled to the field. Despite the fact that he is a teenager, he was given the same standard with 30-40 year old men, who often could not perform and the brigadier beat him daily or every other day. As a result, the lips were damaged and even teeth broke. By nightfall he came home and because of injuries and fatigue he often could not eat, and eventually he went to bed hungry. In 1962-63, as the son of the enemies of the communists,the brigadier sent him without protection to spray very toxic pesticides such as DDT, hexachloride, mercaptophos, which were strictly forbidden all over the world. In September 1963, Khorazmiy fell into the field where he worked and was injured in the right hand. As instructed by the brigadier, he went to work with a damaged arm for 2 more days.By September 21, his temperature rises to 41 C0 and he again loses consciousness. He is taken to a district hospital on a cart. There doctors diagnose him – “osteomyelitis.” The next day, the doctors – traumatologists operated on his arm and pulled out pus from him. – We have operated on it and have done everything we could, but it is unlikely that it will live. Therefore, as Muslims, you must agree with God’s destiny, and prepare a place (grave) for him just in case. -Is it not destined to look into your eyes, hear your voice, listen to the Holy Quran. Mother Khorazmiy, who remained at home, begins to worry and thinks only of her son. Therefore, she goes out on the road and looks forward to her husband’s return. Closer to the sunset, her husband crossed the bridge of the Ayirtam ditches and headed for the house. -How is our son alive? – she met her husband with questions. Maybe from the fact that it was dry in her throat or because she was too far away, he did not hear his wife’s voice and kept walking forward with his head down. Her mother’s anxiety from this only increased, and it seemed to her that her husband was going very slowly. It would be like weeks or even months, until she finds out about her son’s condition. So she ran to meet her husband. Akhmad’s father, despite all his efforts, could not hold back his tears. Seeing his tears, Akhmad’s mother thought that they had lost a son, and with the words: “Oh, son!” falls to the ground, unconscious. – As they say, trouble does not come alone, is it not enough that he lost his son? Oh, God, give me strength and patience to bear this heavy burden! He wanted to call someone to help, but there was nobody around. The nearest house was more than a kilometre away. – Be patient. The Qur’an and Hadith say: “We must be willing – God’s destiny”. According to her husband, she understands that her son is no longer alive. – What, the son stayed in the morgue? And she, not having waited for the answer of the husband, with a cry: “Oh, sonny!” again losing consciousness, falls to the ground. -Our son is not in the morgue. But, he is unconscious and barely breathing. Doctors said that there was no hope, prepare a grave, – and then they barely made it home and cried until the morning. Akhmad’s father loaded the necessary building materials in the morning to dig a grave and went to the “Shirvali bobo” cemetery. – Friend, God grant you strength and patience, be patient. And they are beginning to dig a grave for Akhmad in the northern part of the cemetery, next to the grave of his teacher – Abdullah kari. – Sobir bobo, stop digging the grave for Khorazmiy. Only the Shaytaan have no hope. Doctors are not God and can not give a guarantee that he will die! Thus, they stopped without completing the digging of the grave. The temperature of Khorazmiy gradually decreased and after 2 weeks he comes to himself. From the 17th of September until the 1st of October he did not eat anything. He lived at the expense of glucose, which he injected into his veins. When he was in the hospital for several months, he was not fully treated because of his family situation (poverty), and AkhmadKhorazmiy was forced to leave the hospital. As a result of treatment by unskilled doctors, his right arm was operated six times during 1963-66, but could not be cured. He was awarded the third group of disability.